The apple maggot, Rhagoletis pomonella (Walsh), also known as the apple maggot fly and railroad worm, is native to North America. Originally, it fed on the fruit of wild hawthorn (Crataegus spp. ), but then became a primary pest of cultivated apples, especially in the northeastern United States and southeastern Canada. Varieties that mature in the summer and early fall are particularly vulnerable, but hard winter apples are sometimes infested. 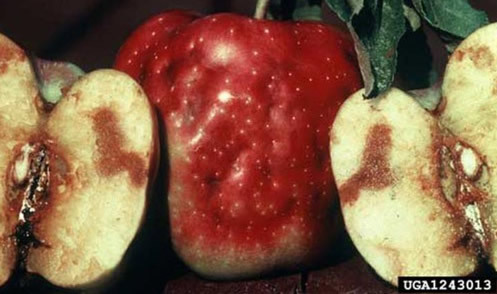 Thin-skinned, sweet, and subacid varieties are most susceptible, but acid varieties may be attacked. Figure 1. Adult apple maggot fly, Rhagoletis pomonella (Walsh), lateral view. Photograph by Joseph Berger; insectimages.org. Rhagoletis pomonella is a pest across eastern North America from eastern North Dakota and southern Manitoba to Nova Scotia, southward to eastern Texas to central Florida, occurring over the entire middle and eastern region of the United States. In 1981 it became established in Oregon and spread to California, Washington State, Utah and Colorado, and eventually Nebraska in 1991 (White and Elson-Harris 1994). Adults: The adult fly is about 4–5 mm, or slightly smaller than a house fly (6–7 mm). It is black in color, with white bands on the abdomen (four on the female and three on the male), and the wings are conspicuously marked with four oblique black bands. Figure 2. Adult apple maggot fly, Rhagoletis pomonella (Walsh), dorsal view. Photograph by Joseph Berger; insectimages.org. Larvae: The larvae are white or yellowish tapered maggots slightly smaller than those of the house fly. The maggots are about 12 mm in length and tapering toward the head. Key characters for the separation of the larval stage from those of related species are given by Phillips (1946). Figure 3. Larva of the apple maggot fly, Rhagoletis pomonella (Walsh). Photograph by Stephen Luk. Adults emerge from the ground during early summer. Emergence continues for a month or more, and many pupae may remain inactive and not emerge until the second year. Egg-laying usually does not take place until eight to 10 days after the flies have emerged. The female punctures the skin of the fruit with her ovipositor and lays eggs singly in the pulp. Eggs hatch in five to 10 days. The maggots develop slowly in the green fruit and usually do not complete their growth until the infested fruits have dropped from the tree, after which growth is completed rapidly. Larval development requires from two weeks in drops of early maturing apples to three or more months in hard winter varieties. Then the larvae leave the fruit and enter the soil where the puparia are formed. Rhagoletis pomonella undergoes a partial second generation in the southern part of the range, with adults emerging in early fall. Winter is passed as puparia in the soil. apple and crab apple, Malus spp. cherry and plum, Prunus spp. Larvae have been found in pear, Pyrus spp., but no adults emerged. In New England, the fly uses the hips (fruits) of Japanese rose, Rosa rugosa and Rosa carolina, as alternative hosts. Rhagoletis pomonella has adapted to sour cherry, Prunus cerasus, in Utah, where it has not been reported from apple (White and Elson-Harris 1994). While plum, pear and cherries also serve as hosts, usually the apple maggot is not a serious pest of these fruits. Crab apples are invariably infested by this pest. 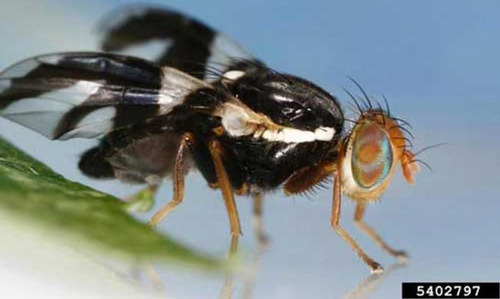 A closely related species, the blueberry maggot fly (Rhagoletis mendax Curran), is important as a pest of cultivated blueberries. Injury to fruit is caused by maggots boring throughout the fruit, forming irregular, winding tunnels which turn brown, often causing premature dropping of fruit. When the fruit is slightly infested, there may be no external indication of the maggots, but when the fruit ripens, the burrows show as dark, winding trails beneath the skin. Minute egg punctures and distorted, pitted areas may show on the surface. Heavily infested early varieties of fruit will be reduced to a brown rotten masses filled with the fly larvae. Figure 4. Damage caused by the apple maggot fly, Rhagoletis pomonella (Walsh). Photograph by Whitney Cranshaw, Colorado State University; insectimages.org. Cultural: The systematic destruction of infested apples and the elimination of hawthorn and abandoned apple trees in the vicinity of orchards are considered valid control practices. Apple maggots in fruits may be killed by placing the fruit in cold storage at 32°F for a period of 40 days. Biological: Hymenopterous parasites recorded from Rhagoletis pomonella are a braconid wasp, Opius melleus Gahan, which attacks the larvae, and a tiny mymarid wasp, Patasson conotracheli (Girault), which attacks the eggs. Because the apple maggot feeds within fruit, biological control agents have not been very effective (Varela 2008). Chemical: Consult local university or state recommendations. 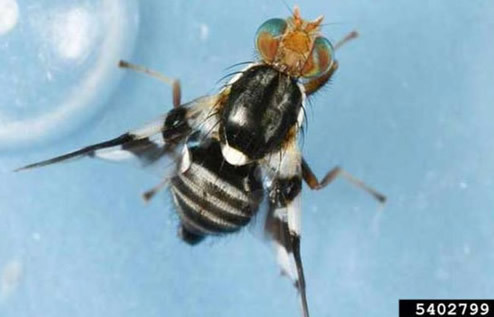 Emergence and dispersal of adult flies must be carefully monitored to effectively time treatments. Sticky traps, including yellow rectangles and red spheres, are used in other areas to monitor adults and time treatments. Unfortunately, only provisional economic thresholds are available for apple maggots, even in areas where it has long been a pest. You can detect the first emergence of adults by hanging yellow sticky traps in abandoned orchards or unsprayed apple trees in infested areas. To detect the beginning of egg laying, hang red sticky spheres in apple trees, then treat as soon as the first fly is found. 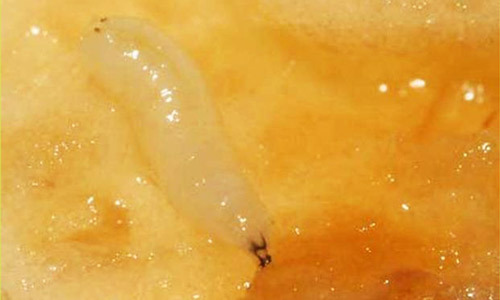 In Oregon, where some orchards are treated regularly for apple maggots, the first maggot spray is applied seven to 10 days after the first fly has emerged. Later sprays follow at 10 to 14 day intervals as long as adults are active and are being caught in traps (Varela 2008). Garman P, Townsend JF. 1952. Control of apple insects. Connecticut Agricultural Experiment Station Bulletin 552. 84 pp. Glass EH. 1960. Apple maggot fly emergence in western New York. N.Y. state (Geneva). Agricultural Experiment Station Bulletin 789. 29 pp. Hodson AC. 1948. Further studies of lures attractive to the apple maggot. Journal of Economic Entomology 41: 61-66. Lathrop FH, Dirks CO. 1945. Timing the seasonal cycles of insects: The emergence of Rhagoletis pomonella. Journal of Economic Entomology 38: 330-334. Varela LG, et al. (March 2008). Apple maggot, Rhagoletis pomonella. UC Pest Management Guidelines (no longer available online). Yee WL, Jack O, Nash MJ. 2007. Mortality of Rhagoletis pomonella (Diptera: Tephritidae) exposed to field-aged Spinetoram, GF-120, and Azinphos-Methyl in Washington State. Florida Entomologist 90: 335-342. Publication Date: January 2002. Latest revision: March 2015. Reviewed April 2018.